As you will see, the LEV Foundation and League of Education Voters board of directors and staff executed activities in support of increasing investments to close the achievement gap, providing educators with much-needed supports for students, and improving post-secondary degree and certificate completion. With the passing of House Bill 2242 (commonly known as the McCleary solution), our state will be closer to fulfilling its constitutional duty to fully fund K-12 basic education. Our work, however, is not nearly complete. We are committed to tracking how these funds are spent and continuing to advocate for improvements necessary to bring better outcomes for every student, especially those who need the most support. Increase investment while using existing funds more effectively to accelerate achievement and close gaps. We asked for a long-term, sustainable education funding solution to the Supreme Court’s McCleary decision, meant to address the 2007 lawsuit McCleary v. State of Washington. The McCleary lawsuit was largely based on the inadequacy of state funding for basic education and the inequities across districts resulting from disproportionate use and allocation of local levy money. In 2017, the legislature increased K-12 funding by $7.3 billion over the next four years. During 2017-2021, the state property tax will assume the cost of teacher salaries and other costs associated with educating a child in the classroom, and local levies will be limited to enrichment programs such as after-school sports, zero-hour band programs, or coach salaries, and reduced to a cap of $1.50 per $1000 of property value or $2500 per student. For school districts eligible for Local Effort Assistance (LEA), their combined local levy revenues and LEA funding are capped at $1,500 per student.In the Supreme Court’s 2016 order, justices noted that the K-12 funding had to be regular and dependable in addressing K-3 class size reduction and teacher compensation. In May 2018, the Supreme Court ruled this plan does that. We asked for an increase in programs and funding targeted toward students who need it most, providing both academic and non-academic supports for students to improve outcomes and make progress in closing the opportunity and achievement gaps. In 2017, the legislature increased overall funding by approximately $500 million over the next four years for programs that close achievement gaps, such as the Learning Assistance Program (LAP), Transitional Bilingual Instruction Program (TBIP), and Special Education. Other student programs such as Highly Capable and Career Technical Education (CTE) also received additional funding. We worked with our coalition partners in the Early Learning Action Alliance (ELAA) to ask for additional funding to increase access and participation in high-quality early learning programs across the state. In 2017, the legislature made significant progress towards the coalition’s goal by adding $25 million to serve 1800 more children in 2017-2018, and allocated $12 million toward increasing the reimbursement rate for providers by 6 percent. A new Department of Children, Youth and Families has been created to consolidate and coordinate early learning with other social services. 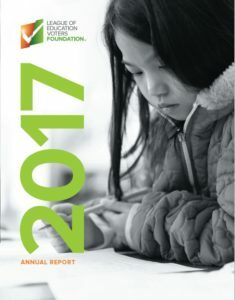 What’s next: League of Education Voters Foundation analyzes the 2017 funding solution and creates recommendations to further remove inequities in the education system, and direct resources to students who need them most, first. Build a highly-effective, diverse and well-compensated instructional workforce that can meet each student’s needs. We asked for a system that attracts, retains, and supports qualified and effective educators, which include teachers, paraeducators, and principals, while addressing needs for equitable access to quality instruction. In 2017, the legislature increased beginning teacher salary to at least $40,000, moved the cost of hiring K-12 staff to the state, provided more resources for mentoring and professional development, removed the staff mix formula that created statewide funding inequities, added 3 regional salary enhancement levels that will increase base salary by 6%, 12%, or 18% based on school district housing values, and allowed local districts to provide salary enhancements to STEM (science, technology, engineering and math), special education, and bilingual education teachers and staff associates. We deepened our relationship with the University of Washington College of Education and researched methods for recruiting and supporting educators of color, as well as effective mentorship programs for new teachers. We continued to bring together education professors and faculty from Whitworth University, Gonzaga University, Spokane Falls Community College, and Eastern Washington University to discuss best practices for supporting new teachers, culturally-competent teaching methods, and trauma-informed instruction. We continued our ongoing partnership with the Center for Strengthening the Teaching Profession (CSTP) and created new relationships with regional and state Teachers of the Year to gather timely information about the conditions of teaching in schools across Washington. What’s next: League of Education Voters Foundation advocates for school staff statewide to be trained in addressing trauma and supporting social-emotional learning, and for every student to have access to mental health services. Improve equitable access to, and supports for, degree and certificate completion. We asked for additional funding to serve all students eligible for the State Need Grant, resulting in 23,000 additional scholarships. In 2017, the legislature partially met the request by allocating $12 million to fund 875 more students, increasing State Need Grant award amounts at nonprofit private four-year universities to equal the University of Washington award amount, continuing to fully fund the College Bound Scholarship, and offering a $15 million Opportunity Scholarship state match. What’s next: League of Education Voters Foundation continues to work toward full funding of the State Need Grant, develops strategies to support students in completing postsecondary credentials, and works to expand eligibility of the College Bound Scholarship to include Deferred Action for Childhood Arrival (DACA) recipients and other select Immigration statuses.